Snow & Rock are holding a boot-fitting training session for their staff at their Manchester Chill Factore store on 21st September (more details at the end if you'd like to be a guinea pig). It's a great idea but it also got us thinking about how important it is to get the right ski boots. Ski boots are what connect you to the ski - so get it right and you will feel in control and confident. Get it wrong and your dream of ripping up the slopes can very quickly turn into a nightmare. If you're thinking of buying your first pair of ski boots, or are fed up with the pain and torture of rental boots, or if you just need to know how boots should feel, then these top tips should help you out! 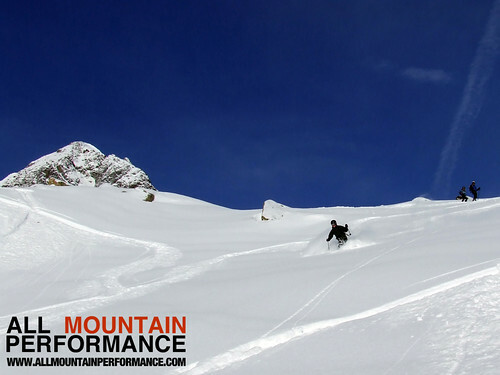 Most seasoned bootfitters will tell you that men will usually over-estimate their skill and experience, whilst women will tend to under-estimate how they ski. Whether in the rental shop or in the process of buying ski boots it's important to be honest about how well and how often you ski. Less experienced skiers require softer shells (the outer casing of the boot) so they can flex the boot and get more feeling back from the ski itself. World cup racers will require extremely rigid shells to give them the control and precision they need when negotiating high speed turns through a race course. But put one in the other's boots and they'll have a miserable time. Most good shops will have a chart/scale where you can identify your level so that the boot fitter will know which range of boots will suit you. The last time I bought new boots I took my old boots into the shop, showed the boot fitter, told him what I skied and how much. He looked at my feet, asked me to flex forward from the heels. He then showed me just 2 models of boot that could be right for me. There was no question of what colour I would like or what brand I wanted. The point is; how they look on the outside really bears no relation to how right they are for you. Once a good boot fitter has determined your level he can then narrow it down, and by looking at your feet can work out the kind of boot that would work best for you. With his/her knowledge of brands they will know what boots will match your foot shape best - so if you like the silver Atomics but your feet are more suited to gold Salomons - that's what you should go for. Getting the right make and model is only the first part of the process when you're buying boots. So your feet can fit into the shell ok but what about if you have long toes, higher arches, narrow heels etc? It's very rare with feet that one size will fit all. So this is where you will now start to customise your boot. Modern ski boots will usually have mouldable inners - the softer padded inner part of the boot. This should fit snugly around your foot and calf. Don't be tempted to go for slipper-like comfort - your skiing will suffer. Once you have decided upon the boot, the boot fitter will then begin the process of moulding the inner to your foot and calf. Something else to consider is getting customised footbeds - and whilst not obligatory this is highly recommended. A customised footbed is a separate product to the boot - there are a number of brands available, Conformable possibly being one of the best known. The footbed is heated and then moulded to the sole of your foot. The footbed can add around £40 - £80 to the cost of your boots. They will last for years however, you can take them with you when you move up to your next pair of ski boots, so they are a great investment. You might have guessed that with all this customisation going on you've got to allow the time to get it done. If you're buying ski boots be prepared to take your time. Allow 2 hours plus and be patient. If you get the feeling that the bootfitter is trying to rush you then don't let them. There was a shop in Chamonix not so long ago who would offer their customers a beer whilst they were waiting for the inners and footbeds to be moulded - good practice but probably not practical for every boot shop! Check, before you make a purchase, that after having spent the time and money on your new boots that you can go back to them if something is wrong. Good fitters will tell you to test out the boots at home, or if possible at a local dry slope or indoor snow centre. Wearing the boots on a warm weekend afternoon will be different to trying them out clipped into bindings where the temperature is considerably lower. Walking around at home in your boots will give you an idea if there are pressure points or anywhere that is causing you pain. A good boot fitter will be confident that you are in the right boots but there may be minor adjustments they can make to make them fit better. It could be something very simple - reheating a footbed slightly to change the shape in one area, shaving a little bit of the footbed off under the toes, adding a little more padding at heel. It will be rare that you'll have to start again from the beginning and experienced fitters will have little tricks of the trade which will make the fit more comfortable. Of course if you're buying boots in resort you will be able to test them out on the slopes. Expect them to feel tighter to begin with but if you do experience pain don't be afraid to go back to the shop. For more details of Snow & Rock's training afternoon for their boot fitters take a look at their Facebook page.